namaskAra! mAterla encha ullar? soukhyana? Today we are going to learn negative and interrogative form of sentences in Past Tense. You already know verb conjugation in Simple Past tense. To make it negative just change the personal endings. Note: You may see some people use ‘iji’ ending for first person singular, ‘yAn pOyiji’ instead of ‘yAn pOyijae’ though grammatically it is wrong. The verbs ‘bar’ (barpini – To come), ‘sai’ (saipini – To die) and ‘bey’ (beypini – To be cooked/boiled) are irregular. I hope you already know how to make interrogative form of sentences in Tulu. Tulu: onas ANDa? / uNDara? English: Yes, what about you? English: Did Jayanth go to work? English: Did you ask her? Tulu: Aye ninna purse kaNDiyena? English: Did he steal your purse? Kannada: avanu ninna purse kaddana? Tulu: I ninna dOstyallen madimeg lettana? English: Did you call (invite) your friends for the wedding? Kannada: nInu ninna geLeyarannu maduvege karediya? Tulu: Ar nikk phone maltijera? English: Didn’t he/she call you? Kannada: avaru ninge phone mADalilva? English: Didn’t you bring milk? English: Didn’t you add sugar to tea? Kannada: nIvu chahAge sakkare hAkalilva? English: Did you sweep the floor? English: Didn’t you wipe the floor? English: Did she wash the clothes? English: Didn’t he wash the dishes? 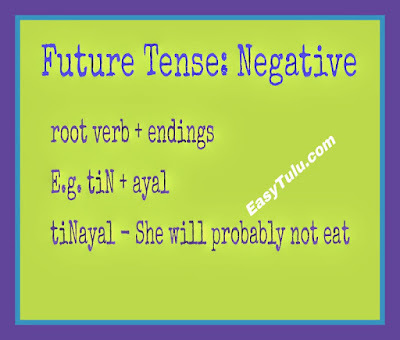 So far, we have learned simple present and future tense in Tulu. 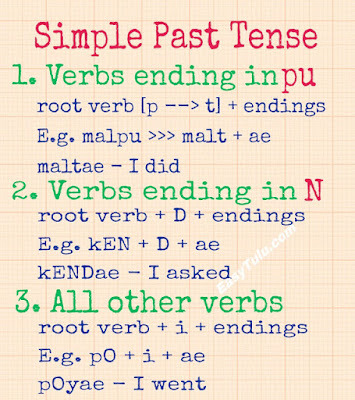 Today we are going to learn Simple Past Tense. Simple Past Tense is used to talk about a completed action in a time before now. The time of the action can be in the recent past or the distant past. Before going to Simple Past, let us learn few compound verbs. As you see in the above example, we have two words in Tulu for one English word. This is what we call Compound verbs. Though second word is always a verb, the first word can be a noun, an adjective or a past adverbial participle. To make verb conjugation, we can apply the same rule here. In all cases, we need to change the second word, not the first one. ‘kondu’ is the past adverbial participle of the auxiliary verb ‘koNu’ (koNuni – To hold) which is used in forming compound verbs and also in reflexive verbs. The verb ‘kana’/‘kondar’ is conjugated same as ‘bar’ and the verb ‘kono’/‘kondO’ is conjugated as ‘pO’. 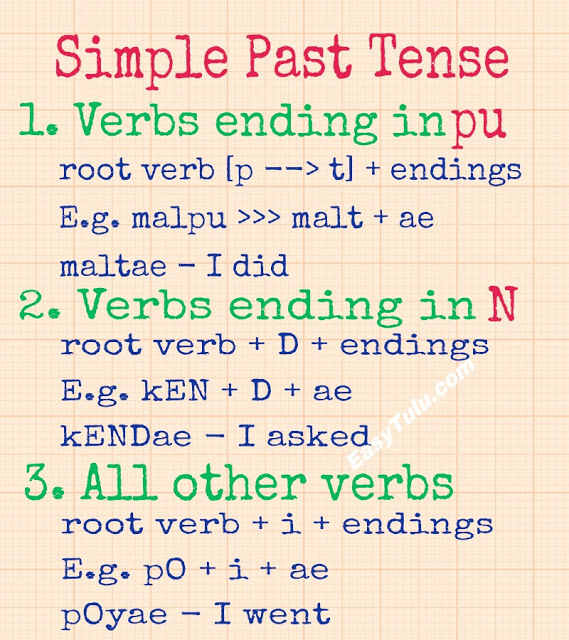 Personal endings in Simple Past Tense are same as Simple Present Tense. Third person neuter singular is exception. To conjugate verbs ending in ‘pu’ in Simple Past Tense, replace ‘pu’ with ‘t’ and then add personal ending. To conjugate verbs ending in ‘N’ in Simple Past Tense, add ‘D’ sound to root verb and then add personal ending. This form is used in common Tulu. However, in some other dialects, verbs ending in ‘N’ also conjugated same as ‘All other verbs’. To conjugate verbs in Simple Past Tense, add ‘i’ sound to root verb and then add personal ending. The verbs ‘bar’ (barpini – To come), ‘sai’ (saipini – To die) and ‘bey’ (beypini – To be cooked/boiled) are irregular. 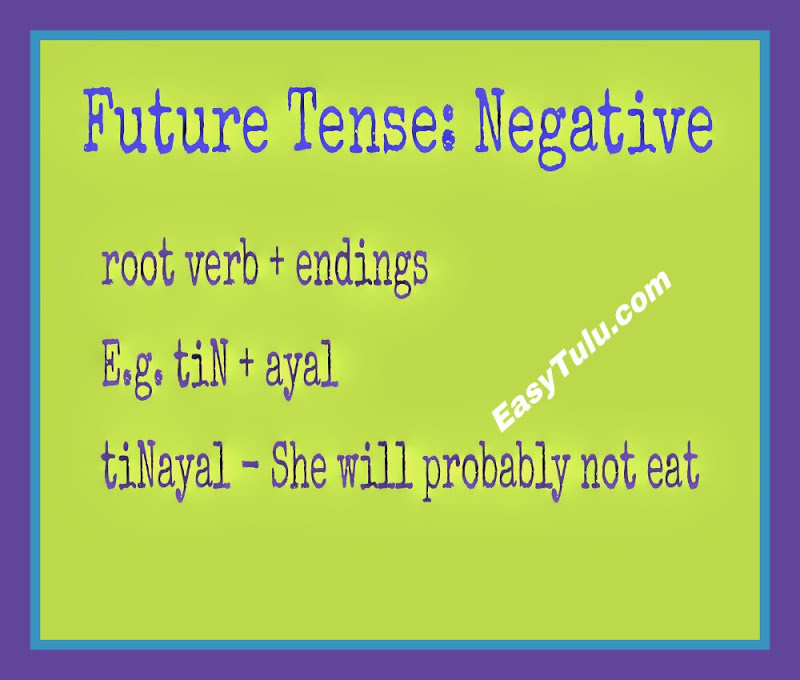 These verbs are conjugated in Simple Past Tense by adding ‘t’ sound to root verb. Let us conjugate more verbs in Simple Tense. English: Guests came to our house. English: I waited for one hour. English: You ate a mango. English: He/She wrote a letter to me. Last week we have learnt how to conjugate verbs in Future tense. I hope you had no problem with that. Today we are going to learn negative and interrogative form of sentences in Future Tense. To make negative form of personal endings in Future tense, we have to add ‘ay’ sound. Third person neuter singular is irregular. 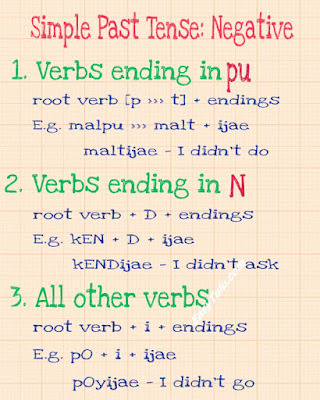 To conjugate verbs, we have to just add personal endings directly to root verbs without using any additional sounds in between. This is applicable for both Class A and Class B verbs. However, verbs ending with long vowels (like pO, dI, mI, A, tU, rA, sai) are exceptions. 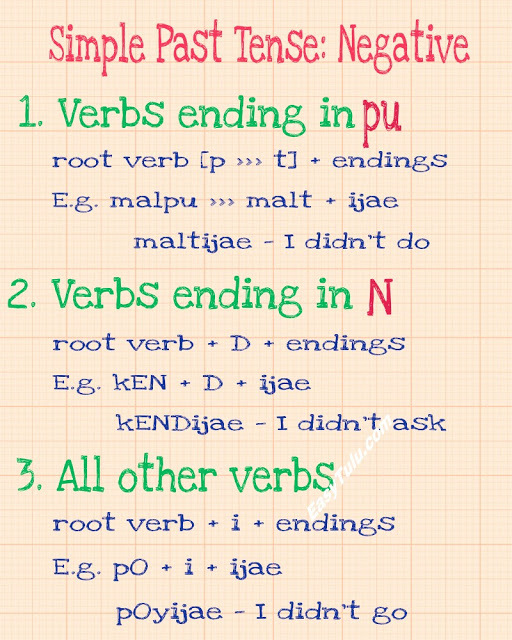 These verbs can be conjugated by adding additional ‘v’ sound in between root verb and personal ending. English: It may not rain today. English: You will probably not speak with me. English: There may not be more than 10 people. English: He will probably not forgive you. English: They may not feel comfortable here. English: You may not feel happy. English: From now on, I will never speak to you. English: He will never leave you. Aye barpena? – Does he come?/Will he come? Aye barpujena? – Doesn’t he come?/Won’t he come? nama onji gaNTeD etta – We will probably reach in an hour. nama onji gaNTeD ettaya – We will probably not reach in an hour. nama onji gaNTeD ettana? – Is there any possibility we will reach in an hour? nama onji gaNTeD ettayana? - Is there any possibility we will not reach in an hour? English: Is there any possibility he will go today? English: Is there any possibility he will be at home? Tulu: Aye illaD uppena, dAnna! Kannada: avanu maneyalli irabahudO, EnO! Tulu: Aye ellae barayena, dAnna! Kannada: avanu nALe bAranO, EnO! Aye Doctor Ape – He will become a Doctor. Aye Doctor Ave – He will probably become a Doctor. Aye Doctor Apena? - Will he become a Doctor? Aye Doctor Avena? - Is there any possibility he will become a Doctor? Aye Doctor Apuje – He will not become a Doctor. Aye Doctor Apujena? – Won’t he become a Doctor? Aye Doctor Avayena? - Is there any possibility he will not become a Doctor? Ayeg bEjAr Avu – He will probably feel bad. Ayeg bEjAr Avand – He will probably not feel bad. 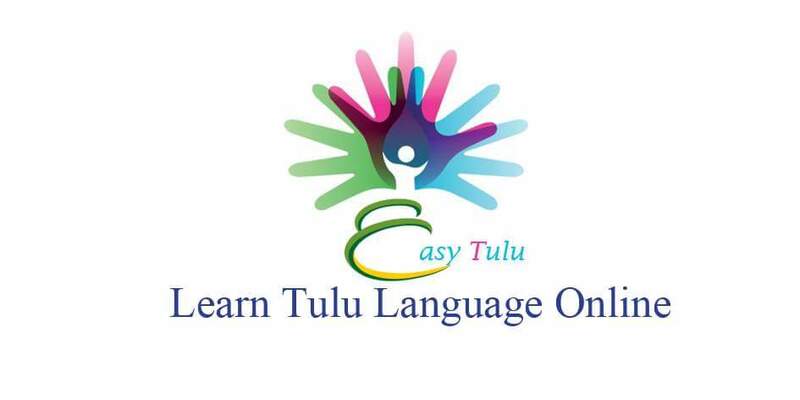 In Tulu ‘Avu’ is also used to express consent like ‘okay’ in English. Tulu: nikk ov Avu? chAna, kAphiya? Kannada: ninage yAvudu AdItu? chahAna, kAphIna? Tulu: chA Ava, kAphi Ava? English: Would you like to have tea or coffee? Kannada: chahA AdIta, kAphi AdIta? All right! With this we come to the end of lesson 8. See you next week!